Dan and I drove to my parents house for Easter weekend. My hometown happened to be hosting the NCAA Men's Basketball Tournament Final Four, so there were lots of festivities around the city. A free music festival downtown on Friday and Saturday featured a few popular artists including Rihanna and Imagine Dragons. We went to see Bleachers on Saturday afternoon and had fun dancing to their hit "I Wanna Get Better." As soon as we walked out onto the lawn before the concert, we ran into my aunt and uncle and my friend Laura and her husband! Too bad Dan stayed home sick (stupid spring colds) because we had lots of fun hanging out and listening to great music! Laura took this awesome panorama... I was tempted to jump up and put my face in it while she was scanning the crowd, but I restrained myself. Saturday evening, the family gathered at my parents house for a delicious ham and turkey dinner. Afterwards (while the Final Four games were on), we dyed a bunch of Easter eggs. So many pretty pastels! I had fun arranging them by color. We got creative with dipping the eggs in multiple dyes, which created a wide spectrum of colors. Dan and I took the little six-pack of blue eggs and had some weird colored egg salad for dinner this week. In addition to pretty eggs, signs of spring were all around. There is a small window well next to my parents house which lets light into the basement. Every summer, a small population of toads appears among the leaf litter. They probably fell down into the hole at some point and have continued to live there, protected from most predators. I hope that they will slowly evolve into some completely new toad species since they are so isolated from the outside world. Christopher and Emily's puppy Winston has gotten bigger (and blonder) since Christmas. Eventually he will be almost white! Doesn't he have the most adorable little teddy bear face?? 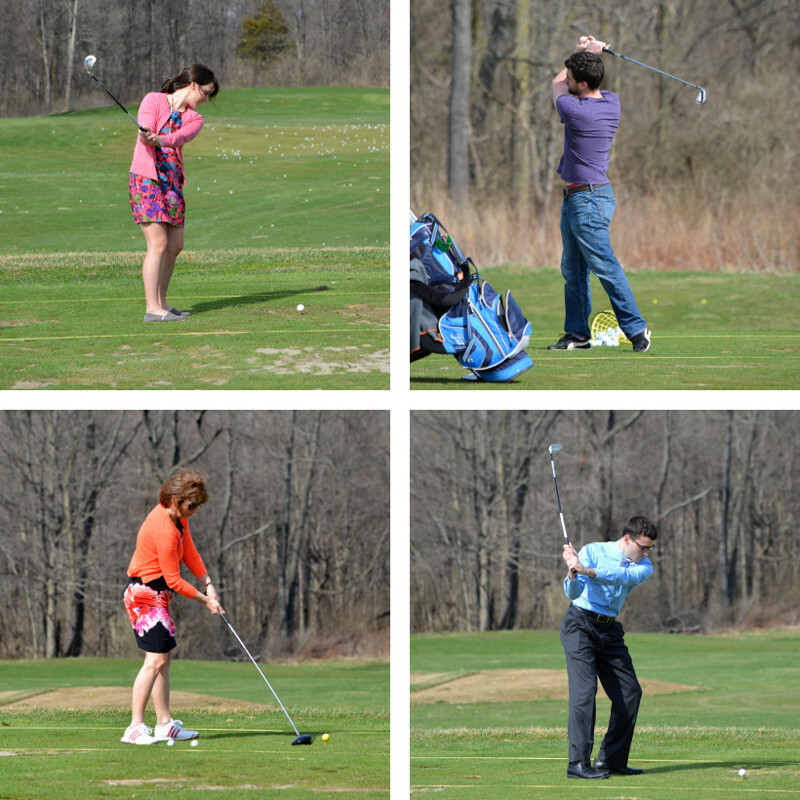 On Easter Sunday we went to mass and then to brunch at a restaurant that is attached to a driving range. We brought golf clubs and comfortable shoes and had fun hitting (or completely missing) a few golf balls before heading home. Christopher out-classed us all, golfing in his bow-tie. I'm looking forward to more pretty spring days, just like this weekend!